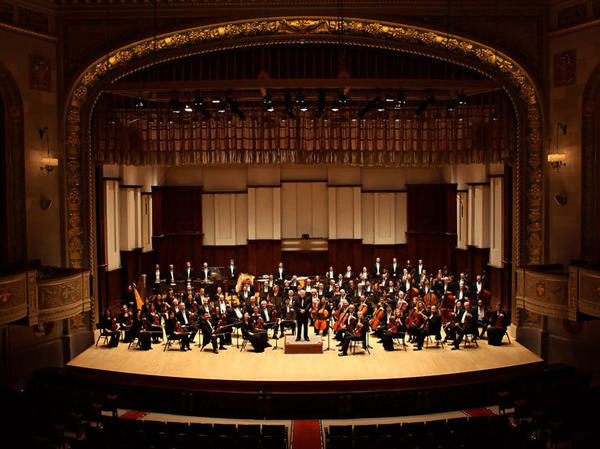 Like many regional orchestras, the Detroit Symphony Orchestra has struggled financially. But after a lot of work, it's set itself on solid footing and become a bright spot in a struggling city. But what happens to the music when it's taken out of that context, away from the pitch-perfect atmospherics, away from the grandeur, and instead it's played in the community, say at a local IKEA in the middle of a busy shopping day? IKEA's acoustics aren't so great, but nothing about the power of the music changes. In a YouTube video of the DSO's recent flash mob performance at a suburban Detroit IKEA, the musicians, casually dressed, assemble with their instruments. A crowd of people stop shopping to watch. They smile, take photos. A little girl pretends to conduct. It was perhaps a more joyful response to the "Ode to Joy" from Beethoven's Symphony No. 9 because the performance was so unexpected. Non-traditional shows like this are part of how the symphony is reinventing itself, after an internal financial crisis almost brought the orchestra down. Ann Parsons, chief executive of the DSO, says an audit in 2008 brought clarity. "At the time, we actually had no idea that the global economic crisis was coming, but the city itself was clearly showing signs of stress," Parsons says. "They said, actually, their evaluation of us is that we would be out of business by December." It was a wake-up call for an orchestra that had been in denial about its decreasing revenues and audience. "There were 40 percent [full] houses, 50 percent houses," she says. "Sixty percent houses were a good night. That's very demoralizing for everyone; for the orchestra looking out at empty seats, for audience members looking around them and seeing empty seats." By 2009, the economic crisis had engulfed Detroit, and philanthropic groups and corporations that the orchestra had always depended on couldn't afford to give anymore. Things had to change. The orchestra was going to have to get smaller, and wages and benefits were set to go down. Negotiations with the musicians' union got tense, and eventually the musicians went on a strike that lasted six months. When it was over, the DSO had a new contract, and for those who stayed, it was a new kind of orchestra. Principal trombonist Ken Thompkins saw many of his fellow musicians walk away for good during the strike. He thought about doing so too, maybe going to teach somewhere instead. But he stayed, and, along with everyone else who did, took a pay cut. It was tough financially, but also psychologically. "It really is hard to not to take that as a reflection of how others think of your art and work," Thompkins says. "Musicians spend so much time developing as instrumentalists. It's so intense and deeply personal, it really is hard not to take it personally." As the orchestra got smaller and cut costs, it also started looking for ways to boost audience numbers. "We looked at zip codes, we did analysis," Parsons says. "We could clearly see where everybody lived that used to participate. And we thought, 'Well, what if we went to them, as opposed to making them come to us?'" That's what they did, performing in community theaters, nursing homes, hospitals, churches and synagogues, in Detroit and the surrounding suburbs, in an effort to lure back patrons who had stopped going into the city to hear the orchestra. They also to tried to attract new music lovers. It started to pay off: Subscriptions went up, and now concerts at Orchestra Hall are selling out. Leonard Slatkin has been the music director for the DSO since 2008. He found in Detroit an exciting and familiar challenge. "I remembered my time in St. Louis as assistant conductor in 1968, when the riverfront was virtually empty, when the nightlife area, Gaslight Square, looked like Berlin in 1945," Slatkin says. "And I watched that city, over 27 years, begin the process of rebuilding and growth, and the orchestra in St. Louis was very much a part of that process. "That's when I began to think, perhaps Detroit is where I need to be." Slatkin says the DSO has now beaten the odds, although the process of reinvention has left some scars. "You had a lot of people who were angry, very bitter," he says. "People who had been here a long time, who had seen the orchestra through a heyday, as it were, and then they saw it as potentially falling apart. And I suspect some of that bitterness still lingers in a few people, but not very many. I think most musicians understand where we are now because we've done this as a shared experience." Thompkins sounds upbeat about the orchestra's renewed role in the community. "Music is a calling," he says. "This is what has chosen us, and this is our life's work. The mission's the same. We're bringing great music and we're lifting the spirits and the hearts of people, no matter what the venue is, and I'm really proud to do that." Detroit's Orchestra Hall is one of the best symphony concert halls in the country. The acoustics are top notch. The theater itself is grand. Important music is made there by some of the country's most talented classical musicians. It's the kind of space that makes music sound like this. MARTIN: That's the Detroit Symphony Orchestra, or DSO, playing last month. But what happens to the music when it's taken out of that context - away from the pitch-perfect atmospherics, away from the grandeur - and instead it's played in the community, say, at a local IKEA in the middle of a busy shopping day. MARTIN: Sure, IKEA's acoustics aren't so great but nothing about the power of the music changes. There's a video of the DSO's recent flash mob performance at a Detroit-area IKEA. And in it you see the musicians - casually dressed - assemble with their instruments. A crowd of people stop shopping to watch. They smile, take photos, a little girl pretends to conduct. Perhaps an even more joyful response to the "Ode to Joy" because the performance was so unexpected in this place. Non-traditional shows like this one are part of how the symphony is reinventing itself after an internal financial crisis almost brought the orchestra down. Ann Parsons is the chief executive of the DSO, and she says an audit back in 2008 brought clarity. ANN PARSONS: At the time we actually had no idea that the global economic crisis was coming, but the city itself was clearly showing signs of stress. And they said actually there evaluation of us is that we would be out of business by December. MARTIN: It was a wake-up call for an orchestra that had been in denial about their decreasing revenues and audience. PARSONS: There were 40 percent houses, 50 percent houses, 60 percent houses were a good night. That's very demoralizing for everyone - for the orchestra, looking out at empty seats, for audience members looking around them and seeing empty seats. MARTIN: By the end of that year, the economic crisis had engulfed Detroit and philanthropic groups and corporations that the orchestra had always depended on couldn't afford to give anymore. Things had to change. The orchestra was going to have to get smaller, wages were set to go down - benefits too. Negotiations with the musicians union got tense and eventually they went on strike. It lasted six months, and when it was over there was a new contract and for those who stayed, it was a new kind of orchestra. KEN THOMPKINS: My name is Ken Thompkins and I am the principal trombonist of the Detroit Symphony Orchestra. MARTIN: Thompkins saw many of his fellow musicians walk away for good during the strike. He thought about doing so too, maybe go teach somewhere instead. But he stayed, and everyone who did took a pay cut, which for him was tough financially but also psychologically. THOMPKINS: It really is hard to not to take that as a reflection of how others think of your art and work. You know, musicians spend so much time developing as instrumentalists. It's so intense and deeply personal, it really is hard not to take it personally. MARTIN: The orchestra got smaller and cut its costs. It also started looking for ways to boost audience numbers. Again, Ann Parsons. PARSONS: We looked at zip codes, we did analysis, and we could clearly see where everybody lived that used to participate. And we thought well, what if we went to them as opposed to making them come to us. MARTIN: That's what they did, performing in nursing homes, hospitals, churches and synagogues - in Detroit, but also in the surrounding suburbs, all in an effort to lure back patrons who had stopped going into the city to hear the orchestra, but also to try to attract new music lovers. It started to pay off. Subscriptions went up, and now concerts at Orchestra Hall in Detroit are selling out. MARTIN: Leonard Slatkin has been the music director for the DSO since 2008. He found in Detroit an exciting and familiar challenge. LEONARD SLATKIN: I remembered my time in St. Louis as assistant conductor in 1968 when the riverfront was virtually empty, when the night life area, Gaslight Square, looked like Berlin in 1945. And I watched that city over 27 years begin the process of rebuilding and growth, and the orchestra in St. Louis was very much a part of that process. That's when I began to think began to think perhaps Detroit is where I need to be. MARTIN: Slatkin says the DSO has now beaten the odds although the process of reinvention has left some scars. SLATKIN: You had a lot of people who are angry, very bitter. People who had been here a long time, who had seen the orchestra through a heyday, as it were, and then they saw it as potentially falling apart. And I suspect some of that bitterness still lingers in a few people, but not very many. I think most musicians understand where we are now because we've done this as a shared experience. MARTIN: Trombonist Ken Thompkins seems to agree. THOMPKINS: Music is my calling. This is what has chosen us and this is our life's work. The mission is the same. We're bringing great music and we're lifting the spirits and hearts of the people no matter what the venue is, and I'm really proud to do that. MARTIN: Be it an orchestra hall filled with those who already love the music or those in a shopping mall who may have just discovered that they do, too. MARTIN: You can see that video of the Detroit Symphony flash mob performance at IKEA and more from our reporting trip to Detroit on our website, npr.org. This is WEEKEND EDITION from NPR News. I'm Rachel Martin. Transcript provided by NPR, Copyright NPR.